After almost fives years it’s time to replace my ageing Arai Viper GT Leon Haslam Replica Helmet. I am sad to see it go up in the loft as it has been a pleasure to wear it, although of late it is letting in too much wind through the visor which is making my eyes water at times. After trying on a few different helmets at Hein Gericke it appeared that although I liked the Shoei helmets, they didn’t like my head. 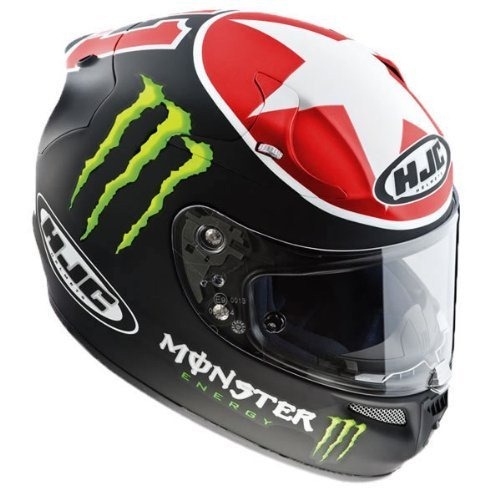 After being advised that Arai hadn’t updated the technology within their helmets for ages I decided that a HJC helmet was the best bet. So I then spent the next week scouring the internet to see what designs were available. In the end I decided to purchase the HJC R-PHA10 Ben Spies Limited Edition helmet. It arrived the other day and came with a free smoke visor as well. But alas although it was pinlock ready it didn’t come with one, so I went on the internet again to purchase one. The helmet is very light and feels like a quality item. The only problem I have with it, is the fitting of the speakers for the Autocomm kit. When I put the helmet on with the speakers in but without a balaclava on my ears bend over and don’t have the room to bend back, unless I stick my fingers in. Hopefully when I am able to test the helmet out the speakers won’t start to hurt my ears over a long days riding. Other than that minor issue and I am very happy with the helmet. Update: The helmet was supposed to come with a pinlock insert, so they sent me one in the post. So now both visors have pinlock inserts, which makes it very easy to change them over now. The initial position of the speakers was no good, but I have managed to find an acceptable location for them now. After having a few rides in it, I found it to be very comfortable but quite warm to wear (opening the upper vents solves this). No fogging issues at all, lifting the visor up and down takes a bit to get used to (if you haven’t had a centre visor lock before). Overall very nice helmet and very pleased with the purchase. They are still available through Amazon. S, M and L. Mine was from nightingales through Amazon. Once you have selected the best Maddog design and found a dealership, you'll be prepared to purchase. Your web research will pay off. It's so easy to discover these types of scooters online. We do not recommend purchasing from a dealership or website that isn't an authorized Ice Keep provider all of us at Power Toy Planet http://www.PowerToyPlanet.com.